Home » Review » Smile! It’s A Sloth Selfie! 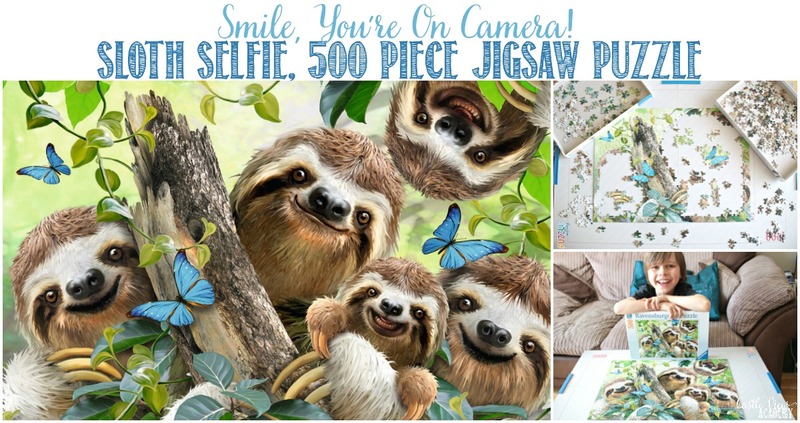 Who can resist a cute family of cuddly sloths? 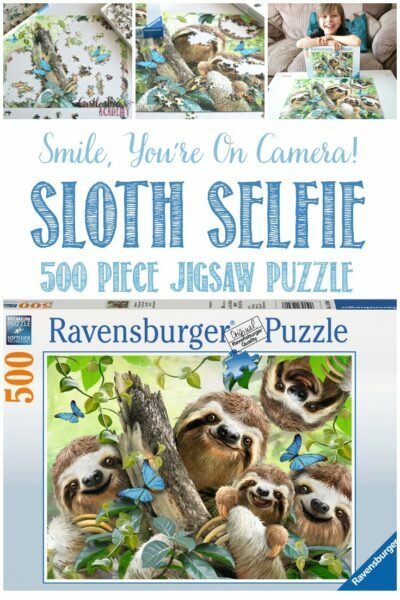 When I asked the family if they’d like to review the Sloth Selfie puzzle from Ravensburger, they all gave a thumbs-up and so they were watching for the post person to deliver a package with a distinctive rattle to it. Our family loves to work on puzzles; either individually or together (or both at the same time), which is why I actually sorted the centre pieces from the edge pieces in the box while sitting at the desk while Kallista finished off another puzzle on the Puzzle Handy before I could use it. 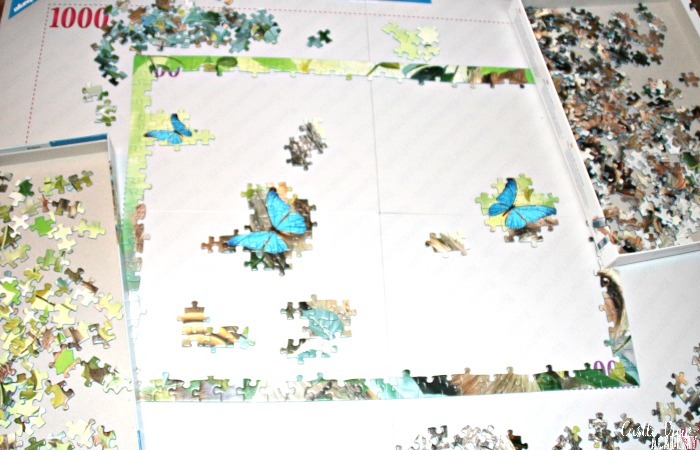 It took her a little longer than expected to finish…or maybe I was just working a little fast and being impatient, so I put together the edges in long lines inside the box lid, and then began putting the bright blue butterflies together on the desk top. The butterflies were easy to spot and certainly gave the puzzle some brightness and light against the fur and greenery. Now Kallista was done and stored her puzzle away and I moved the butterflies to the little table to spread out and really get to work. After the kids went to bed I wasn’t feeling like heading off to work as I had been very busy with my nose to the grindstone over the weekend so I hung around and Phil and I watched some TV reruns and worked on the puzzle together. Phil did a great job of working on the tree trunk that the sloths were clinging to. 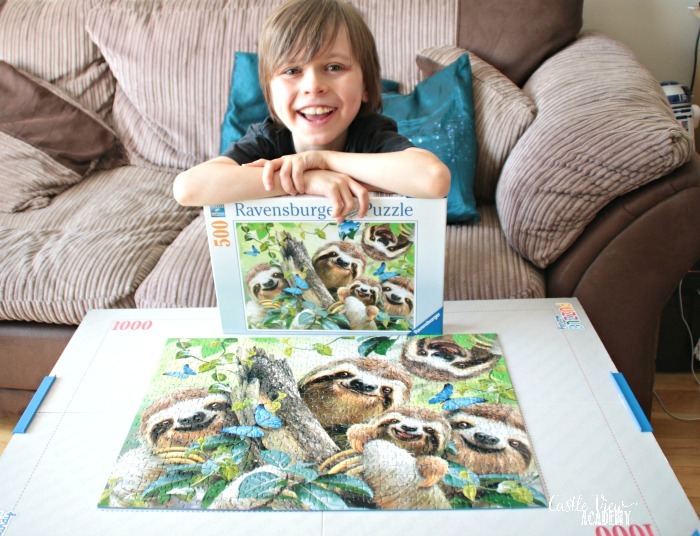 Monday came around all too quickly and I needed a break from the monotony of laundry between wrestling with the loads so I worked on the puzzle intermittently with the kids throughout the day as we all worked on the greenery and the brighter parts of the sloth fur. 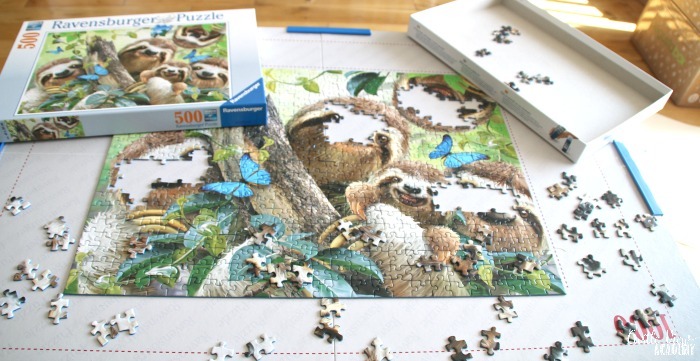 As you can see, the last part of this puzzle that was completed were the centres of the little sloth faces. There were 5 little faces that were all very similar and you couldn’t quite tell where each one would fit until it did fit. After 24 hours, the puzzle was completed! We did wait until the next morning with better light for Tristan to want to snap a selfie with the sloths! The next time you’re looking for a little uplift and light in your life, just try not to smile when you have 5 little smiling sloths grinning up at you! 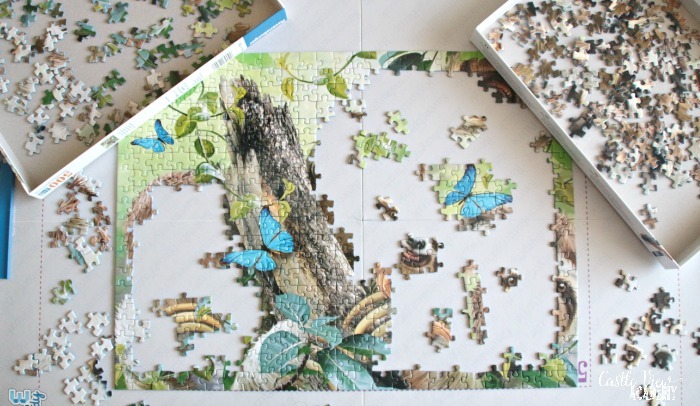 This puzzle is cute enough to use some puzzle conserver on it and then hang it in a child’s room so it can be enjoyed. Ravensburger Sloth Selfie, 500pc Jigsaw Puzzle is available through fine retail stores and Amazon.co.uk. 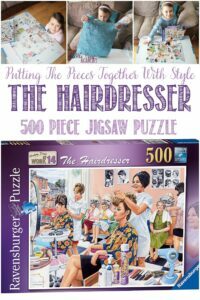 The Ravensburger Puzzle Handy is also available from Amazon.co.uk and retail outlets. Crystal has an excellent writing style. 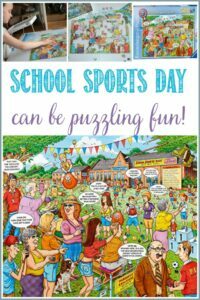 Engaging for the reader with good use of imagery that makes for an entertaining read (a very happy model in the completed jigsaw photo!). Recommended for your bookmarks to enjoy in your next coffee break!